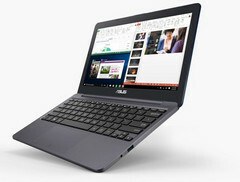 Asus is known for their price-competitive ultrabooks such as the well-received UX305 and its successor, the UX306. But if you're looking for something even cheaper, Asus's VivoBook line of highly affordable sub-notebooks have also historically been great value for the money. The Taiwanese OEM has just updated their 11-inch E20x VivoBook series with Apollo Lake Celeron and Pentium Processors. The VivoBook E12 E203NA and E203NAH will come with either Apollo Lake Celeron N3350 (dual core) or Pentium N4200 (quad-core) CPUs. The NAH model will support a 2.5-inch HDD up to 1TB (meaning the user can also upgrade it themselves), but will be thicker and heavier as a result (0.82 inches and 2.7 lbs). The NA model will have 32-128GB of eMMC storage and weigh 2.2 lbs at 0.67 inches thick. Despite being budget laptops, the VivoBook E203 will still pack 802.11ac WiFi, HDMI, microSD slots, and two USB 3.1 Type-A and one USB 3.1 Type-C ports. While the construction and keyboards are usually decent on these laptops, the display will only be 768p. It's not clear if the screen is TN or IPS. The new laptops will be available with either Windows 10 or Linux. Pricing has not yet been released, but it's likely that they will cost around the same as the previous laptops in the series: between US$200-300.